As you know if you read my recent review of Rappaport (in Rappaport Compleat), I am a fan of the late Morris Lurie, so I am pleased to be able to offer another Giveaway, this time for a most interesting work called Cleaning the Stables. also published by Hybrid Publishers here in Melbourne. Shortly before his death in 2014, an elderly man brought his publisher friend a crumpled purple folder filled with type-­‐written pages. 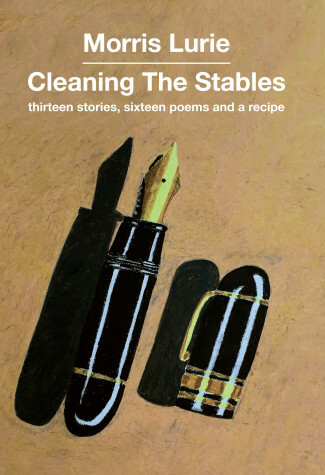 Cleaning the Stables he called it: a selection of stories, poems and a recipe that he didn’t want left behind. In this posthumous collection we are given a feast of mostly unpublished treasures from the great literary life of Morris Lurie. Written in the wry and ironic style he was celebrated for, these pieces are sometimes odd, always clever, and at times profoundly moving as they give us insight into a man who had a truly unique way of interpreting and writing about the world around him. Author Info Morris Lurie (1938 – 2014) has written more than thirty books including Flying Home, selected by the National Book Council as one of the ten best Australian books of its decade; The Twenty-­‐Seventh Annual African Hippopotamus Race, voted by the schoolchildren of Victoria their favourite young storybook by an Australian author; and the Bicentennial Award-­‐winning autobiography, Whole Life. Morris Lurie was the recipient of the Patrick White Award in 2006. “one of the most significant Australian writers of his generation” – Peter Pierce, editor of the Cambridge History of Australian Literature. BTW I’ve had people tell me that they are shy about entering if they’ve already won a giveaway. Please don’t feel bashful, you can enter as many giveaways as you like! Hello, Lisa! Wry and ironic, odd and clever sounds perfect! Please enter me in the draw. Yes please Lisa, count me in. And I might have to re-read Flying Home which I see I have on a distant dusty shelf but don’t remember at all. Thanks for your last comment – I fit squarely into that category but would love to win a copy of this. Pick me pick me…. please. *chuckle* We’ll have to wait and see what the Random Number Generator comes up with!